“You’ve been taught how to make pasta right?” asked my Italian friend, at the start of a standard half-hour conversation about food. “I do know how to make pasta!” I exclaim. “I learnt on farms in Italy!” “Carbonara, pesto…” I stumble. S***. What else do I actually know how to make well? By this point my friend is already mid-monologue about the various different types of pasta one can dream up.. “ There’s amatriciana, gricia – USE GARLIC – pomodoro classico, olio pepperoncino, arrabiata, carbonara, cacio e pepe, pesto – but this is DIFFICULT – vongole, la bottarga…” He goes on and I sink into my seat as it dawns on me, very sadly, that after nearly a year of living in Italy I know very little about making pasta. Not to worry. “I’ll teach you how to make pasta!” my friend gallantly offers. “Great!” I exclaim, looking forward to a fun, free cooking session. He arrives the next day. I’ve bought the required ingredients. Lots of spaghetti and lots of cheese. I’m still waking up. He marches through the apartment to the kitchen, rubbing his hands as if preparing for a Masterchef challenge, “have you got…?” he reels off a long list of ingredients whilst unpacking some of his own equipment (lol). “Yea, yea, yea…” I wander round the kitchen aimlessly, attempting to appear a prepared and confident accomplice. Two hours later we have made four different sauces and sampled two of them. I’m stuffed and exhausted. In the UK I think we have this idea that pasta is an easy supper-option: boil up some water, dump in the pasta, heat up a bit of dolminos and you’re good to go! But here, how one makes pasta is a VERY serious issue. I’ve seen couples have full-heated arguments about the use of garlic, and families engage in 20 minute-conversations about when to put salt in the water and how long to cook pasta. For young men, making pasta is also an assersion of masculinity. The pasta-making performance is a show of strength, good-timing and culture. As I was about to learn, it’s really not so easy to make pasta well. 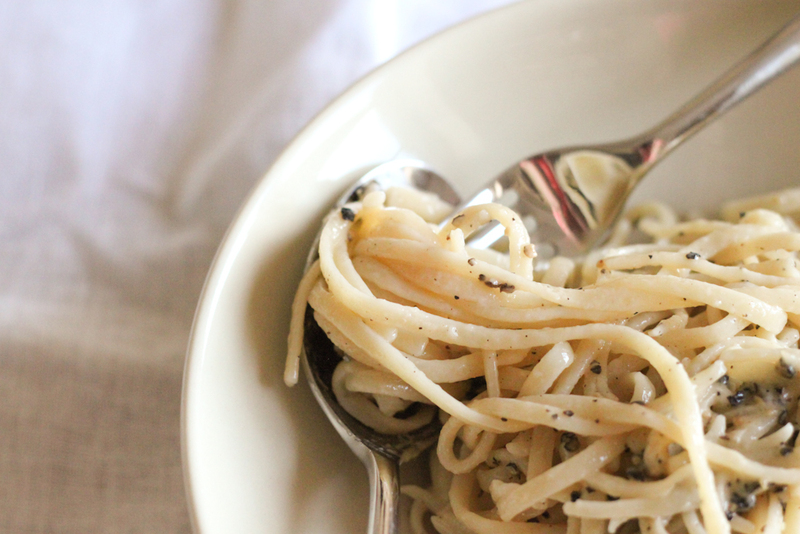 Here’s one recipe I learnt, Cacio e pepe – a traditional Roman dish. ‘Cacio’ means cheese in Roman dialect. Put a bit of oil and a generous serving of pepper in a pan. Warm on a low heat for 1-1.5 minutes. Grate 50g of pecorino with 20g parmesan. Grind in lots of pepper and stir. Cook the spaghetti in boiling water with salt (fat salt cause it dissolves more slowly and will evaporate less quickly) for however long it says on the packet. But remember, you’re always looking for an al dente result! Before you drain the pasta, extract half a glass of boiling water from the pan, and put to the side. Add the cooked pasta to the hot oil and pepper – all this must be done VERY VERY QUICKLY. In a serving bowl, add the water and the cheese mixture. Stir well, VERY QUICKLY. To make the creamy sauce, the balance between parmesan and water is very important. Et voila. Seems simple, doesn’t it? Ha, good luck…e Buon appetito!